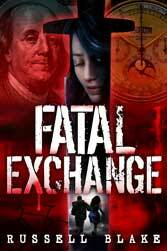 Fatal Exchange is a gritty,”edge of your seat” thriller by first time author Russell Blake. The author cleverly combines a well paced, CSI styled crime thriller, with a “no holds barred”, plausible international conspiracy. The story centers around Tess, a spunky, misplaced bicycle messenger, tirelessly working the Manhattan courier, who becomes entangled in both conflicts. Set squarely in the sights of an elusive serial killer and pursued doggedly by a ruthless, clandestine interrogation/murder team, Tess weaves her way through both worlds, as everyone around her starts to fall victim to the two very different, yet equally deadly threats. Detective Ron Stanford is stuck in the middle both conspiracy. A youngish detective assigned to a “special homicide” investigative unit, he initially meets Tess through his investigation of a set of serial murders targeting bicycle messengers, and soon becomes enmeshed another set of bizarre murders popping up throughout the city, all linked to a mysterious transaction completed by Tess’s father. I felt like I was reading two parallel novels, each feeding into the other seamlessly. Even if you’re not a fan of detective fiction, you will thoroughly enjoy this book. The international conspiracy aspect is equally represented, and the two genres blend beautifully. I never once felt tired reading this book, and the only time I found myself skipping ahead, was to find out what happened next, then I’d go back and fill in the details. The story is seriously compelling, and the characters are well developed…just don’t get too attached. Fatal Exchange is not for the squeamish. A demented serial killer and two Myanmar black ops agents that go to extremes to extract information from their victims…will leave you grimacing at times. However, there are plenty of breaks from the intensity, as Blake develops his characters and delves into their psychology and background. Even the killers are given human dimension, although disturbing. You will not find any cardboard characters in Fatal Exchange, which was a rare break from other books in these genres. I can honestly say, that if I could find more books like Fatal Exchange, I would be left with absolutely no reason to read some of the “Brand” name authors on the market today. Thanks, Mark. I just grabbed a sample of Murderson. I love the cover. Yikes!